The ZWO ASI290MM Mini (Mono) is a CMOS astronomy camera for autoguiding and planetary astrophotography. It houses a high-performance SONY IMX290 1/3” monochrome sensor with 2.1 Mega Pixels. 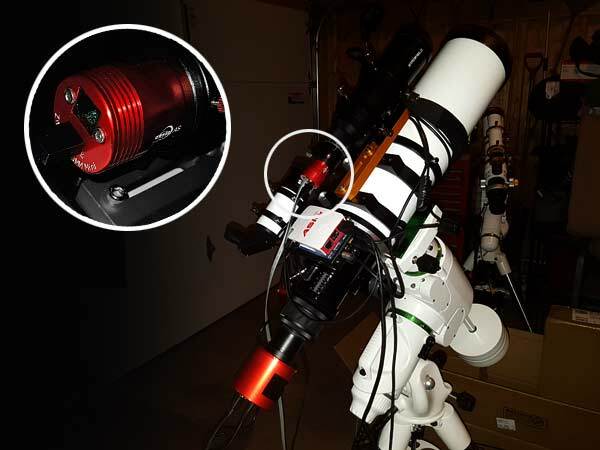 I’ve recently installed this guide camera on my deep sky astrophotography rig, that includes a Sky-Watcher Esprit 100 ED telescope on an EQ6-R Pro mount. The camera now sits in a 60mm StarField guide scope, anxiously waiting for clear skies. This is ZWO’s first miniature camera in its lineup, and the boy is the internal sensor tiny! It adds virtually zero weight to your imaging payload, and its slender profile takes up no more space than a 1.25” eyepiece. 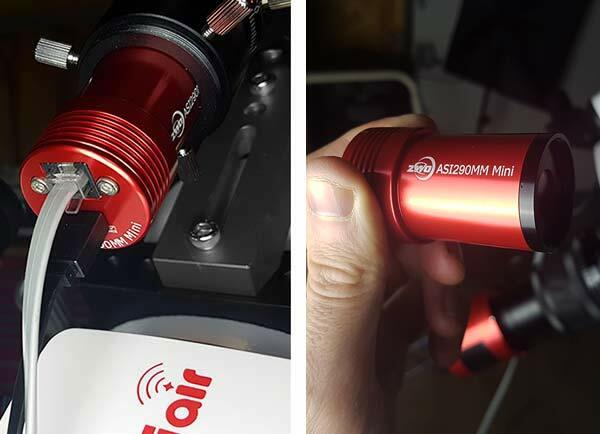 On top of the impressive specs of this miniature astronomy camera, it’s also one of the most popular guide cameras to use with the ASIair. Not to be confused with the ASI290MM (Mono), which is a completely different camera, the 290MM Mini aims to provide amateur astrophotographers with a practical autoguiding solution. 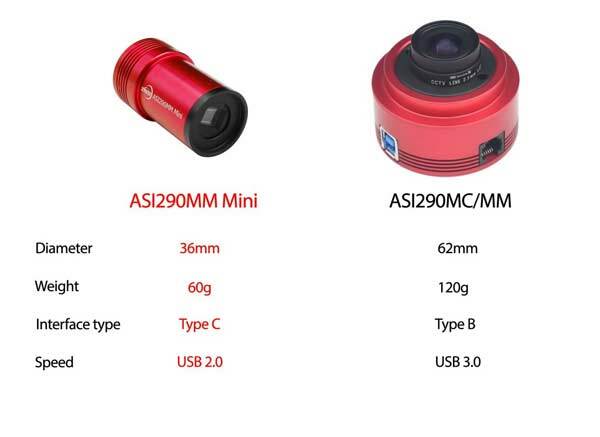 At the time of writing, this USB2.0 camera is only one of 2 that is supported by the ASIair smart WiFi device (all others are USB3.0). Although the camera sensor in the 290MM Mini is very small (1936 x 1096 pixels), it is a very capable autoguiding camera for deep sky astrophotography. The pixel size of the 290MM is 2.9 μm x 2.9 μm, and provides 12bit ADC. When it comes to autoguiding, it’s important to have a guide camera that is sensitive enough to detect several guide stars in the field. The ASI290MM Mini sensor includes amp glow reduction circuitry, which helps it produce high-quality guide exposures that detect subtle star movement. I personally use the ASI290 Mini with my StarField 60mm guide scope for autoguiding purposes. My favorite features of this camera thus far are its small size and compatibility with the ASIair device, (and that it matches my red ASI294MC Pro)! This miniature camera can also be used for planetary imaging. 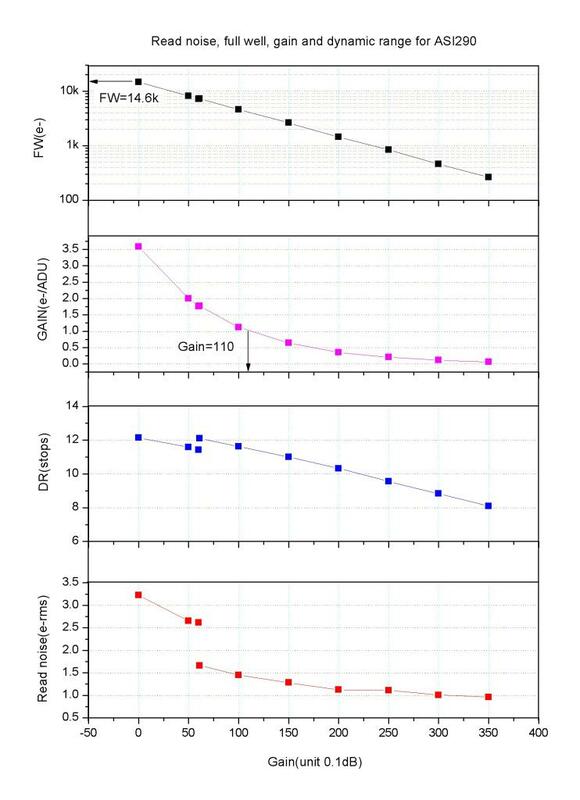 Small sensors with low read noise and high QE (quantum efficiency) are beneficial for high-resolution imaging of the Planets. This camera uses a 12bit ADC (Analog to digital converter) with a high quantum efficiency output. The mono SONY IMX290 sensor in the ASI290 Mini is highly sensitive. This means that more stars can be detected in short guiding exposures. The 2.9um pixel size provides the slightest of movements of your guide star, thanks to a high arcsec/pixel ratio. Compared to the ASI 120MM, the 290 improves guiding precision by 30%. The 290MM Mini works with the ZWO CS adapter and CS Lens and is suitable for OAG (Off-axis guiding). All of the camera drivers and image capture software you’ll need to get started can be found on the Software and Drivers section of the ZWO website. 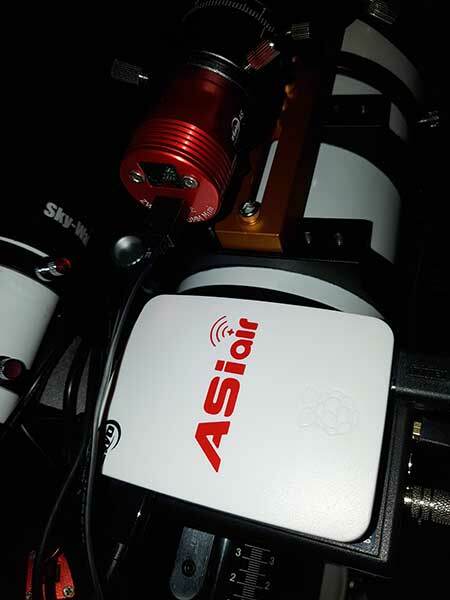 I’ve used several ZWO ASI cameras with Astro Photography Tool in the past, and will now leverage the convenience of WiFi control via the ASIair. The ZWO ASI290 MM Mini includes an ST4 port to connect the camera to your telescope mount. I’ll use this monochrome camera to guide my telescope on a Sky-Watcher EQ6-R Pro mount, and power the guide camera with an ASIair WiFi camera controller. The ASIair software includes a standalone autoguiding system, but I could also use the traditional method of PHD2 guiding with my laptop computer. This is the first astronomy camera I have ever used that uses a Type C USB 2.0 port. This connection type is popular in mobile devices and modern laptops. This camera came with 2 “flat style” USB cables (0.5m and 2m), which are really handy and give this device a premium feel. Because the ASIair supports all ASI 3.0 and Mini cameras, I can plug the USB Type C cable into the USB port of the ASIair, and the 290MM is instantly recognized in the ASIair app on my Android phone. 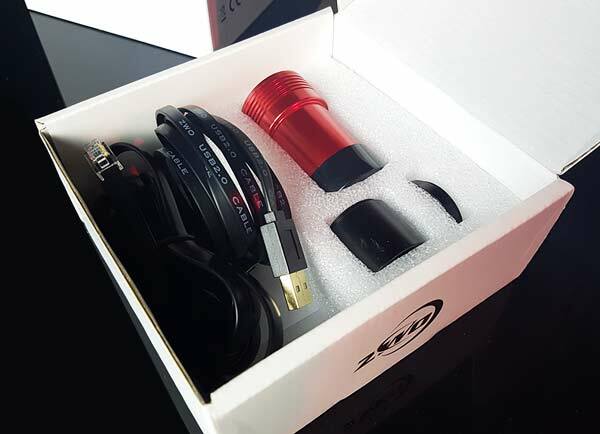 The ASI290MM Mini comes with all of the necessary cables and adapters in an impressively handsome box for neat storage. 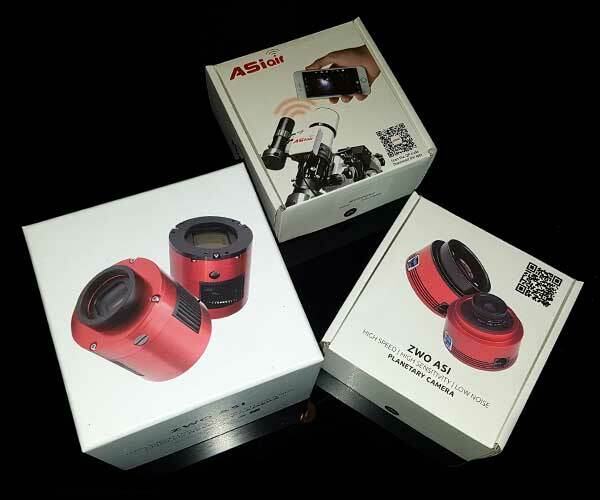 ZWO has done a superb job of branding their ASI cameras and providing the best possible user experience for beginners. The SSAG (Orion Starshoot autoguider) is a popular guide camera with a comparable sensor size to the 290mm Mini. In the reviews I have read, the SSAG sometimes struggles to find guide stars (especially when using OAG). However, the ASI290mm mini does not have this problem, and guide stars are quickly detected, even after a meridian flip in an automated sequence. Previous owners of the SSAG found the 290mm Mini to be a big upgrade. Although the pixel scale is advantageous for planetary imaging, the USB 2.0 transfer speed (20.4 frames per second) may slow you down. 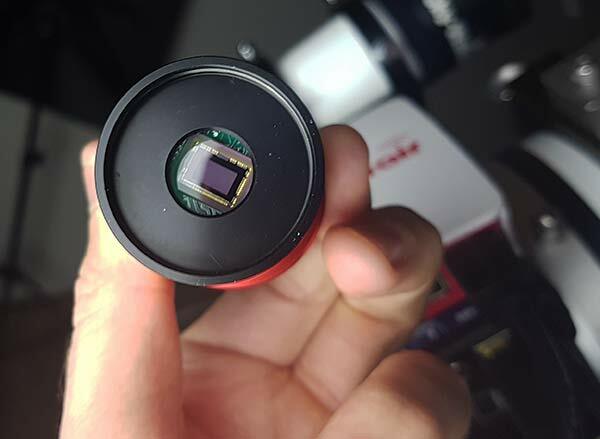 Deep sky imaging is also possible, but the tight, uncooled sensor may lack the image size and SNR you are aiming for. I would place the ZWO ASI290MM in the autoguiding camera category. If you’re interested in a camera that was built for taking large deep-sky images, consider the ZWO ASI294MC Pro. For a detailed review of the ASI290MM Mini, have a look at the following thread on Cloudy Nights. Have a look at the 290MM Mini in use for planetary photography on the moon (video). You can expect a detailed review of this guide camera from me in the near future (If the clouds ever go away)! I’ll control the 290MM Mini using the dedicated ASIair app on my Android Galaxy Tab A Tablet.